Paris is a hot, sticky, muggy city during the summer months. You’ll need to find an occasional cold treat to cool your body. luckily, there are several Wanna Juice bars to quench your thirst. Wanna Juice bars are small restaurants similar to Jamba Juice in the States. You will see a menu board of blended juices, a fridge with yoghurts, snacks, and salads. 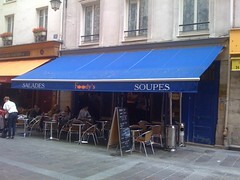 Soups are also available for lunch. Wanna Juice has a fairly reasonable lunch menu with soup or salad, bread, and small smoothie for around 8 euros. Purchasing a smoothie by itself may give you some sticker shock. I had the Fast Breakfast smoothie this afternoon for 8.20 Euros, which is a little over $12. The smoothie was great, it had berries, fresh orange juice, yogurt, muesli, and honey. The tasty concoction made me forget about the price. My friend had an orange/strawberry smoothie. He’s a big fan of the Orange Dream Machine smoothie at Jamba Juice. I liked Wanna’s better; it didn’t taste like baby aspirin. There are 4 locations for Wanna Juice. Each is located near popular tourist destinations. 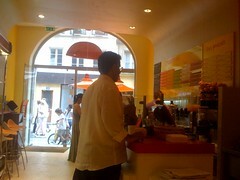 You’ll find it to be a fresh alternative in the sticky heat of a Paris summer. Ask for the frequent buyer card; buy ten and get one free. That may take a bit of the sting off of your currency conversion analysis. The Mouffetard and Montorgueil locations are also surrounded by great vegetarian bistros, markets, and tasty boulangeries. Both areas are great places to visit for a taste of Paris life. Mouffetard is also home to some hostels and is close to the Universities. There’s a small street at the heart of Paris that has captured the “heart” of the city. Rue Montorgueil is a pedestrian friendly street behind Église de Saint-Eustache and Chatalet – Les Halles. 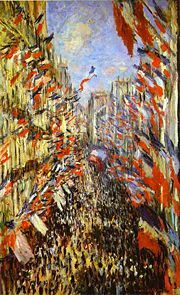 It’s perhaps best known by Monet‘s painting of a festival on June 30, 1878 to celebrate the end of the World’s Fair. This street is home to the oldest pâtissier in Paris: La Maison Stohrer; creator of the Baba au Rhum. It’s also home to several famous and memorable restaurants, cafes, gelato stands, and much more. Needless to say, there’s some stiff competition in this area for restaurants. Foody’s Salad Bar is a simple, comfortable restaurant that has found it’s calling amongst the more classical and/or tourist restaurants. It’s menu is simple, the food is fresh, the atmosphere is comfortable and unrushed. I stopped by on a Saturday afternoon and grabbed a bowl of vegetable soup and a much needed coffee. There were several small families enjoying the outdoor tables. The service is pretty simple, you walk in, grab a tray and start creating a salad. There’s also a small pasta bar and soup is available at the counter. You can also get sodas, juices, coffee, and more. First off, coffee is not their specialty. It was hot, caffeinated, and hit the spot. But I wouldn’t go here for coffee as a rule. They do, however have a house specialty of hot chocolate that should be good. 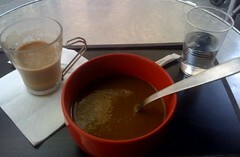 More importantly, the soup was very good. It was a roughly pureed soup of market vegetables served in a large bowl. It was flavorful and satisfying. They also had a Tomato soup and a Gezpacho with tomato and basil. They cost only 4.50 euros. The salad bar features a variety of fresh vegetables and prepared salads. You can choose either a small (5.50 Euros) or large (7 Euros) plate to fill. The pasta bar is also quite affordable. I didn’t see any meat on the menu, although there may have been some tuna on the salad bar. This shouldn’t deter your Meat Eating Friends. This restaurant has more than enough variety to satisfy anyones cravings. Foody’s also sits next to Naturalia, an organic store, an organic sandwich shop, and a juice bar. I guess you could call this section of the street “the heart of veggies in the heart of the city on the street that captures the heart of the city”. All in all, it’s good for the cœur.